Newlite are your local bifolding doors specialists, offering a quality range of premium, bespoke bifolding doors from several top brands. We have put together our simple to understand bifolding doors glossary of terms explaining some of the most commonly used descriptions for the hardware, design and operation of bifolding doors. Bifolding Doors Glossary of Terms. Bifolding door configuration is the term used to describe the arrangement of your doors. From the number of panels to the sliding direction and whether they open inside or out, this all comes under configuration. Our AluK range of bifolding doors in configurable with handle and colour choices, profile designs and a choice of threshold options. Bifolding door sight lines refers to the physical proportions of your bifolding doors and especially where the door panels meet in the closed position. The thinner the door the better the light transmission and visibility through your doors. Our AluK bifolding doors start with sight lines as impressive as 141mm making them one of the most aesthetically pleasing on the market. One of the most requested elements of a bifolding door is the Traffic Door. The traffic door works exactly like a regular single door, hinged and openable without having to fold all the doors back to go out to your garden. You will find a traffic door very convenient for day-to-day use. We highly recommend a traffic door if your new door is the only door that leads out to your garden. Polyester powder coating refers to the colouring process used on aluminium. There are over 200 colours available with polyester powder coating giving you more choice with aluminium than any other material. The powder coating process not only lets you have your desired colour but also protects the aluminium. A simple routine wipe and clean with mild soapy solution is all that is needed. Polyester powder coating gives you a different colours inside and out as well as contemporary metallic finishes as well. Bifolding door frame, cill and jambs. Frame cill and jambs refers to the perimeter frame you see fixed to the wall of your house. The cill is the term used for the bottom of the doors and the jambs for the two vertical sides. The outer frame is the first item to be installed with the door panels to follow. Bifolding door locks fitted to the primary leaf are multi point hook locks with a locking cylinder and a robust, attractive lever handle. Your bifolding door lock ensures your doors stay locked secure as well as giving you convenient access. The lock is housed in the door leaf and engages into the keeps found on the outer frame jambs. Bifolding door cill and threshold. The bifolding door cill is a separate section that sits under the bottom of your doors. The requirement for a cill depends on the site condition, and every property is different. The purpose of the cill is to deflect water away from the front of the doors when it rains. The cill also bridges the structural cavity and the damp proof course. The bifolding door threshold is found at the bottom of the doors. This is where the sliding components sit to enable the doors to operate. The thermal break is the insulation material used to help with the energy efficiency of your new bifolding doors. Made from durable polyamide, thermal breaks bridge the gap between the inside and outside of the aluminium profiles making them warmer and working with the glass to lower your energy bills. Our AluK bifolding doors feature this advanced polyamide thermal break and are one of the most energy efficient folding doors you can buy today. We even offer a choice of glass options to make your doors even more energy efficient. Bifolding door panels relate to the number door leaves a door set has. Bifolding doors are available from two to eight panels with the option to slide to the left or right and stack in or out. 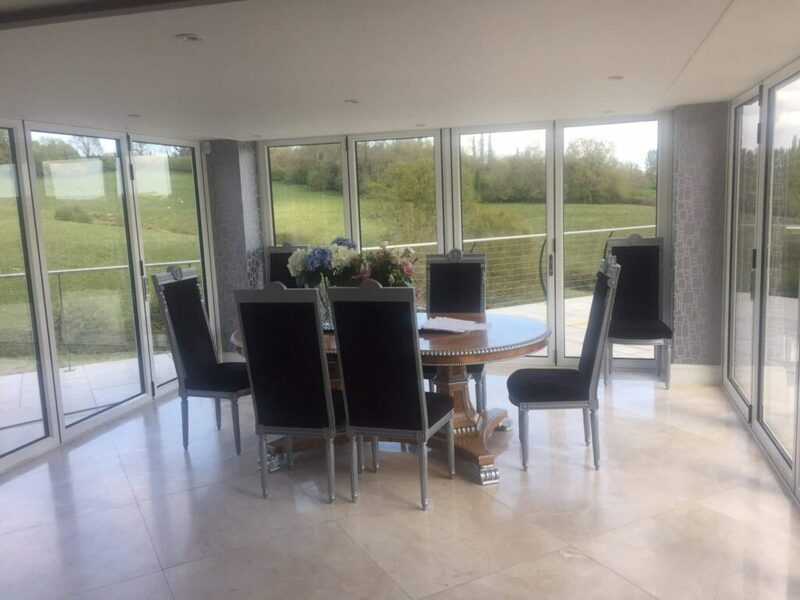 If you would like more information about our bifolding doors, how they can work in your home and the many choices available, contact us today.